Whoa, Nelly! What a story! 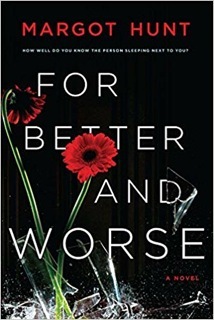 I I absolutely LOVED For Better And Worse by Margot Hunt. It was riveting, suspenseful, and so addicting!! On their first date, law school students, Natalie and Will, discuss the topic of "how to get away with murder". Little do they know that years later, that conversation will be of utmost importance to both of them. Flash forward, Natalie and Will are married with a son. They are both attorneys who seem to be busier than normal. Life seems to be passing them by and Natalie has started to notice how distant her husband has become - his only friends seems to be his cell phone (hmm...). And then, out of the blue, some shocking news brings them both together once again. The principal at their son's school, a man they had befriended years ago, has been charged with sexual misconduct with a male student. Shocked by the news, Natalie and her husband are convinced that these accusations must be false - their friend would not do such a thing. Except, Natalie talks with the victim's mother and finds out something that makes her stop and consider how well she knew her "friend". Plus, things get a lot worse rather quickly when her own son confides in her that he was also a victim of the Principal's sexual proclivities. Say what?! Yep, Natalie's so-called friend molested her son. Talk about devastating news. Armed with this new information, Natalie tells her husband what must be done to the man they once considered a friend - he must die. Shocked at his wife's idea, Will tells her that they must go to the police. He tells her that she is scaring him with such a crazy idea of murder. Seeing that her husband is not one to depend on in this situation, Natalie lies to him and tells him they will think about what to do next for their son. Except, Natalie has already decided what must be done and she is determined to get it done. As an attorney who defends criminals for a living, she knows what will happen at trial and refuses to allow her son to be subjected to such horrible proceedings. She knows that justice must be meted out and she must be the one to do it. And, that is all I will write about this captivating story. Suffice it to say that Margot Hunt has written a thrilling story chock full of drama and suspense. I really enjoyed getting to know Natalie as she struggled with accepting that someone she knew could be a monster and then dealing with the consequences of her actions. It was such a gripping read. I would happily recommend For Better And Worse to fans of Margot Hunt and anyone looking for their next great read. That sounds like quite a story!! wow. I can see why you got drawn into this one. What a compelling premise! Woo! This sounds like a fabulous read! Thanks for being on the tour. Lark, I know, right? Such a compelling read! Heather, it really is. Thanks so much for having me on this tour!